Yesterday, Google added an Earth View layer to Google Maps. 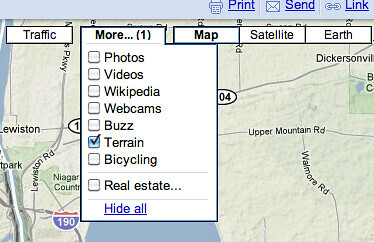 That means you can interact with Google Maps as you would in Google Earth, the desktop application. 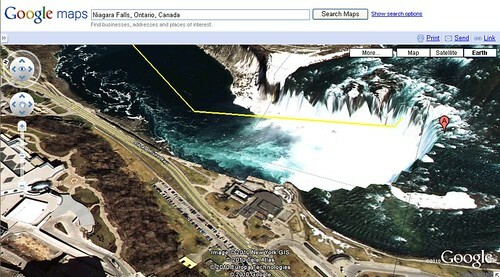 It is actually pretty neat, here is Niagara Falls in Earth View (you may have to minimize the left side pane). In any event, it doesn't seem to work too well on a Mac, specifically Chrome for Mac - so this picture was taken using IE on a PC. But with any new addition to Google Maps, you have some users who are not happy. Many thought Google removed the Terrain View. It has not been removed, it was moved into the "More" menu. Forum discussion at Google Maps Help Forums. Previous story: Internet Explorer Users More Likely To Click On AdSense Ads?